The Lost Summer Part 2 picks up where I left off at the end of part 1. 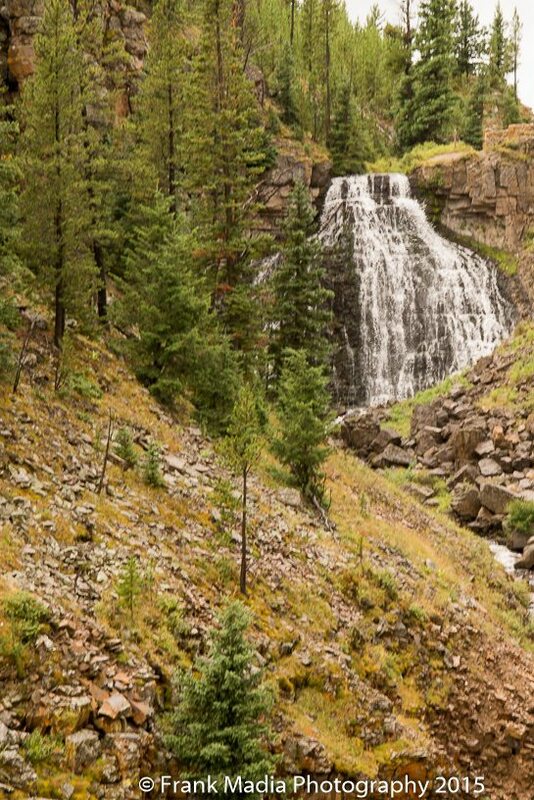 During the second week in July, my brother John, his wife Sandi and his fishing buddy, Jack, were to be in that portion of Montana that wraps around the northwest part of Yellowstone to fish. Because it was a fishing trip, we wouldn’t be able to spend too much time with them. So, we decided to get together for dinner one evening while they were so close. Connie and I rented a room at the Silver Tip Lodge in Ennis, Montana which is near the small town where we were to have dinner. Of course, we made the most of the opportunity by taking back roads to get to where we were staying. We sort of wanted to see where it was that Cinda and her friends had been camped. We were not able to find that place, but we did have a great time looking for it. We met up with John, Sandi and Jack at Wells Fargo Steak House in what had been the Wells Fargo Office in years long past in the town of Virginia City, not far from Ennis. After dinner we drove around this small town for a while. It was really a living ghost town. By that I mean most of the buildings were really old and had served many purposes over the years. There were many houses, but none were very new. It was sort of stuck in a time long ago with some modern encroachments. We had a wonderful visit with John, Sandi, and Jack, but as their accommodations were to the west and ours to the east, we made an early evening of it. That was fine with me, because I had noticed that our brakes were miss-behaving on our drive and we had made an appointment to have them looked at the first thing the next morning. The brake job ended up being a replacement of the rear pads and rotors and quite naturally chewed a pretty good hole into the morning. We eventually went back to the park via Bozeman and a stop at my favorite camera store, Bozeman Camera and Repair, where I finally purchased the professional model camera I had been drooling over for so long, the Nikon D610. More to follow on that. At any rate, I did dedicate a lot of time to the process of reviewing the images and making any minor color corrections that might be necessary to achieve an image that reflected what I had actually seen with my eyes. Complicating the whole process is the differing requirements for image size between the two websites. 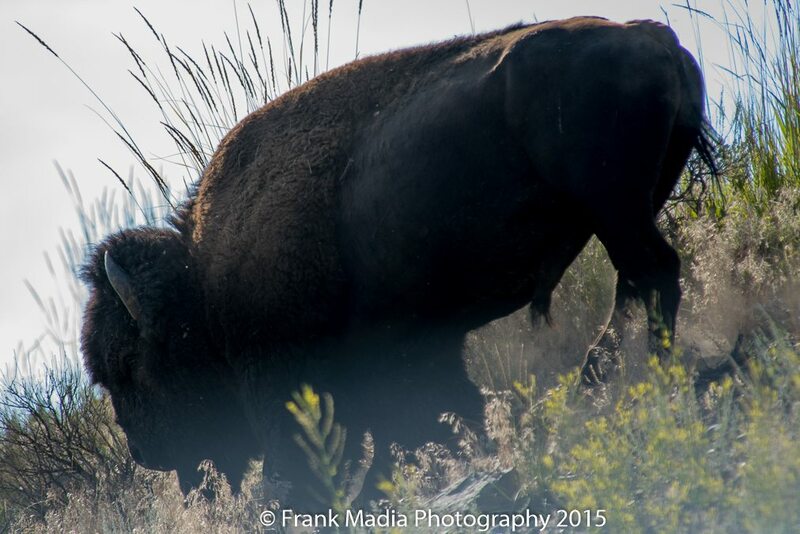 For Frank Madia Photography, I have to downsize the file size and adjust the pixel count to prevent theft and optimize the appearance for the website theme. For my pages on the Fine Art America website, I have to upload the full-size file in order to ensure the largest possible prints can be made from them. That takes some doing and further required setting up a file system that afforded me the opportunity to upload the appropriate files to the appropriate website. One of the really neat things about having teamed up with Fine Art America to sell my images is the wonderful range of products that are available through them. If you have not had the opportunity to visit my Fine Art America page, take a few minutes to go to the portfolio in this website and then click the purchase button that appears below any selected image. 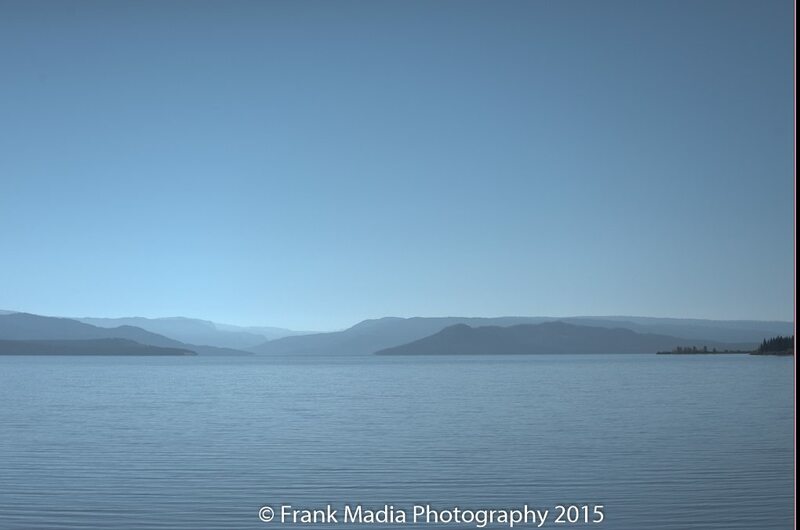 You will open a new page in the Fine Art America site to the same image you started with. Fear not, you have not committed yourself to any purchases at this point. What you have done, though, is allowed yourself to see the full line of products available with that image. The largest of my images can be reproduced on items as small as a cell phone case and as large as a duvet cover or shower curtain and everything in between. Since Fine Art America supports so many artists they have a huge advantage of being able to buy raw materials in great bulk thereby keeping costs to the consumer about as low as possible. I feel quite fortunate to have been introduced to this company and their business model. I feel pretty good about the successes I have experienced to date. I made my first sale within 24 hours of my website going live. That sale included two decorative pillows with images of a Green heron stalking his lunch. Since then I have sold cell phone cases, a tote, several greeting cards and several framed and unframed prints. The truth is I have spent very little time on marketing my work as I am still trying to determine the most cost-effective way to accomplish that. My profits have come nowhere near my investment in web development, business cards, license fees, etc., but given how little marketing effort I have been able to make I feel pretty good about where this little retirement job is heading. By the way, Bob Frick, if you read this, I don’t think this venture qualifies me for returning to the workforce. Okay, infomercial over. You can dry your eyes and keep on reading. Of course, I had to do a lot of practicing with my new camera. This squirrel was sitting on a tree branch right outside our bedroom window eating pine cones. He was so close I had trouble focusing on him as it was difficult to get far enough away for my long lens. He was pretty patient with me. He would eat a cone, move off his perch, get another and come back to the same place. I was able to make a lot of camera adjustments to see what happened. It was a good training session. A few days later, Connie and I went on a short walk along the Big Horn Trail so I could get some more practice with the new gear. The Big Horn Trail is sort of our backyard while at Indian Creek Campground. 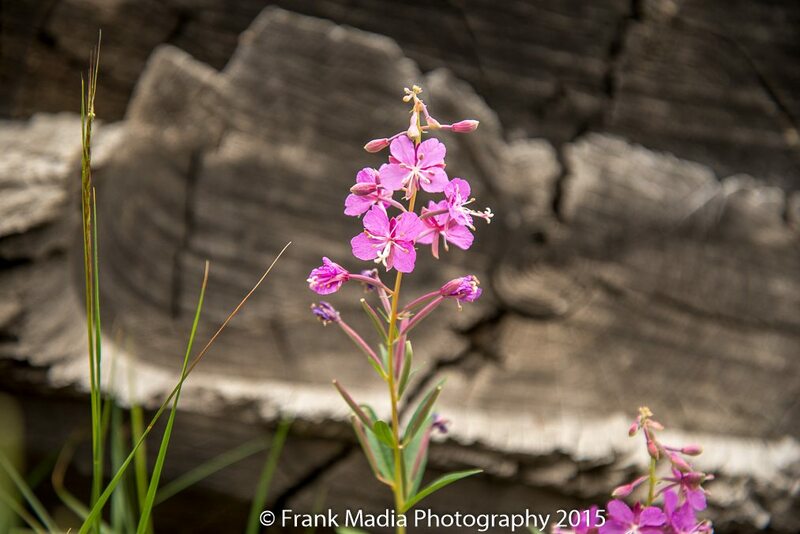 I found this Fireweed standing proudly against the perfect background to highlight the flower’s details. 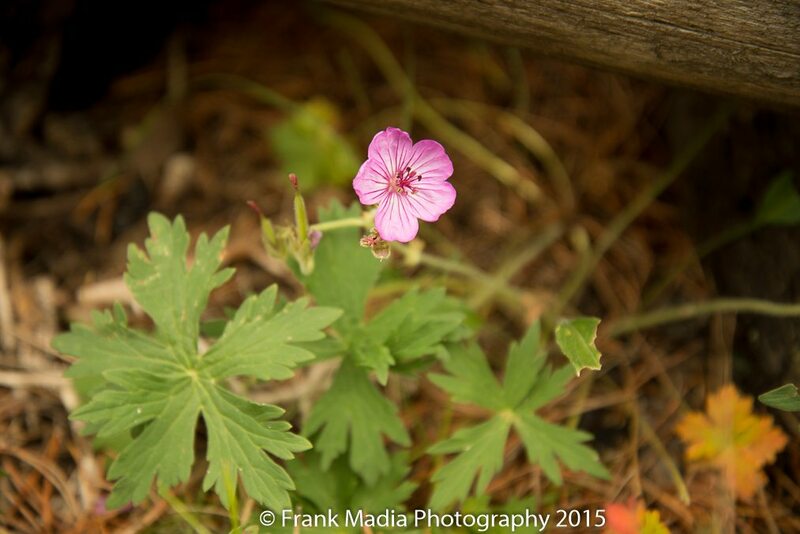 This is a Sticky Geranium (Geranium viscosissimum) of the Geranium Family, also known as Cranesbill. 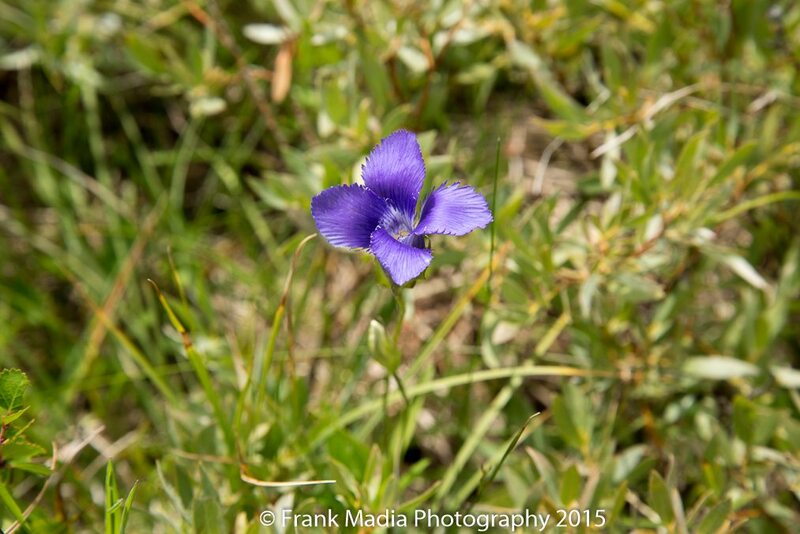 It is found in sagebrush, grasslands, and open woods. 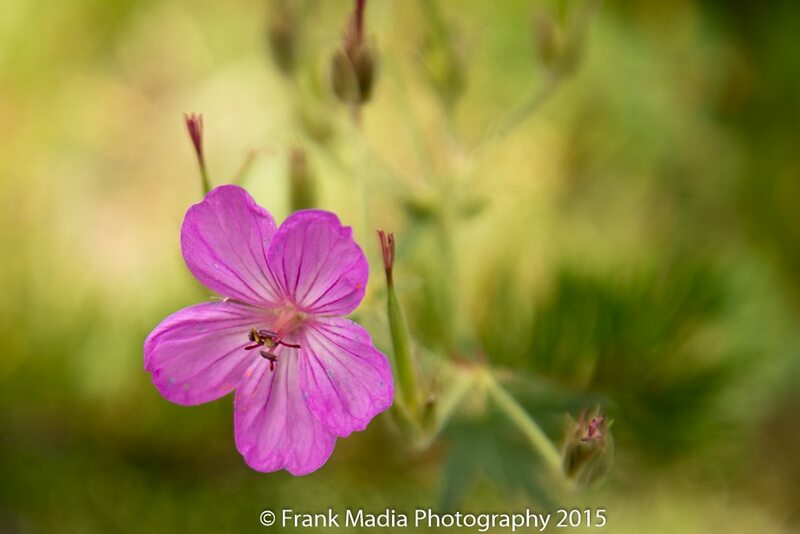 A closer look at the Sticky Geranium. I wanted to test the new camera’s ability to get in close. I think it worked out pretty well. Fringed Gentian (Gentianopsis thermalis) This flower has a really deep blossom referred to as a vaselike structure in the field guides. I am sorry I didn’t get an image from the side to show the entire blossom. 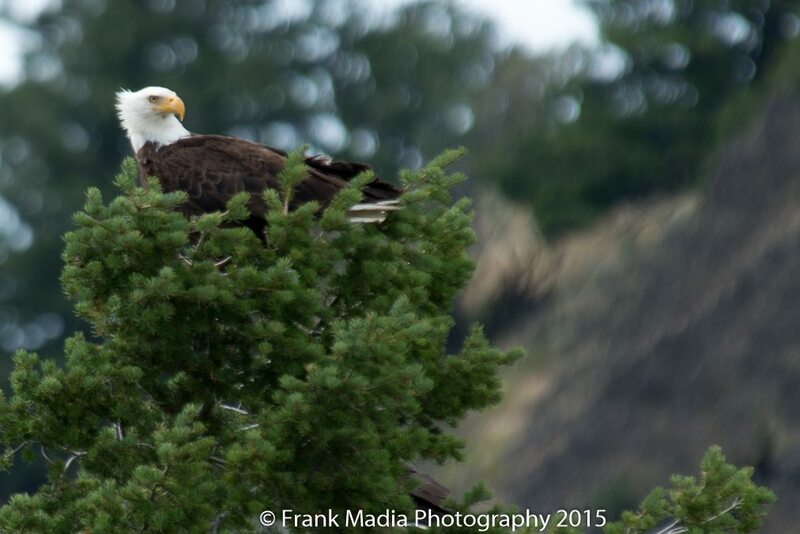 On a very windy afternoon as we were driving east of Mammoth I spotted two bald eagles off to the northeast. I parked the car and walked in to get as close as possible without spooking the birds. I even took my tripod on this shoot, as I knew I would not be able to hold steady enough for as long a shot as this would be. This is a crop of a much wider view of one of the eagles. The other one was perched below and on the back side of the tree. If you look hard you can see a bit of a wing or tail just above the Ph of the watermark. The wind certainly kept me from getting a completely focused image, but I sort of like the impact it had on the head feathers of this wonderful creature. I used a boulder as a blind while getting this shot. I didn’t feel comfortable moving in any closer, as there was nothing but grass and sagebrush between the boulder and the tree. Frequently on our days off, Connie and I sit out on our patio and enjoy a cappuccino and some fresh fruit to get our mornings started. I always take the camera out just in case. This little fella was on the prowl for a free handout. 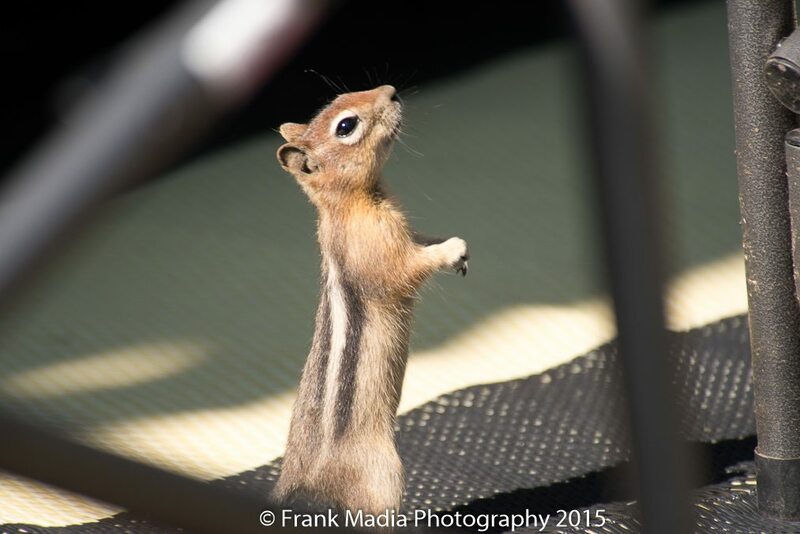 I am fairly certain that some of our campers must have been feeding the chipmunks because he was just too brave. 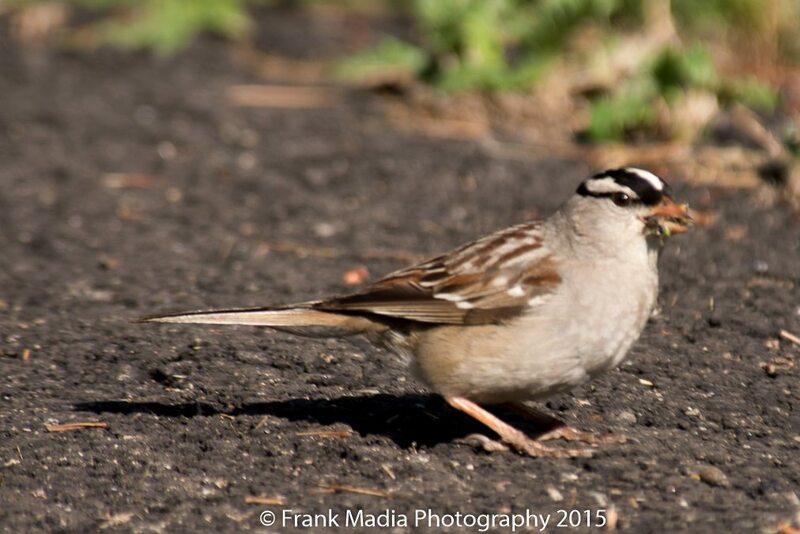 The same morning that I captured the chipmunk looking for a handout I got a good look at a White-crowned Sparrow. He too was looking for breakfast, but it was a more traditional meal for him. He was eating seeds from the flowers. On a drive in early August, we came across a bit of an animal jam. 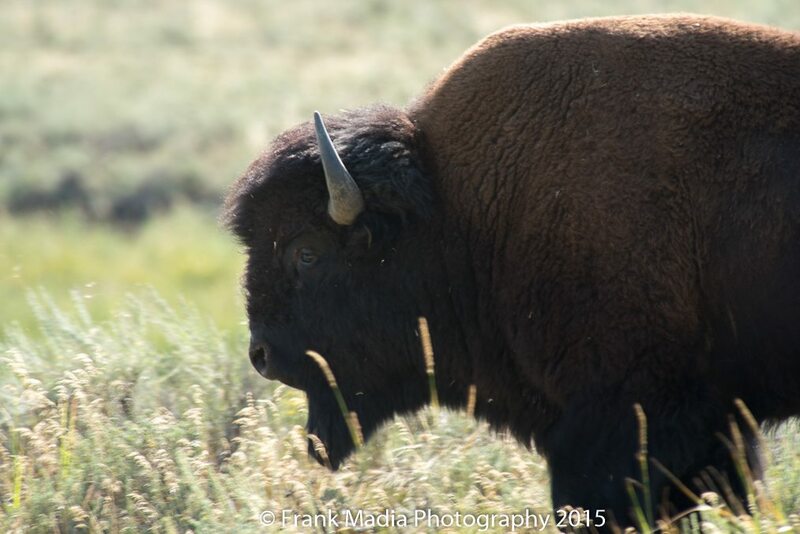 This one was caused by a bull bison who was above the road and headed down and across. I stopped the car well back and jumped to get the action. In this image he is just meandering towards the edge. Quite the well-groomed fellow, don’t you think? As he started down the steep slope towards the road he was terribly backlit. I did my best to make a reasonable image. I really like the way the tall grass fans out above his massive body. I have to admit I tweaked this image a good bit to recover some lost detail due to the extreme backlighting that existed. I also cropped it a bit to remove some out of focus distractions. I try to avoid both of those actions when at all possible. The Golden Gate under a rare August Fog. 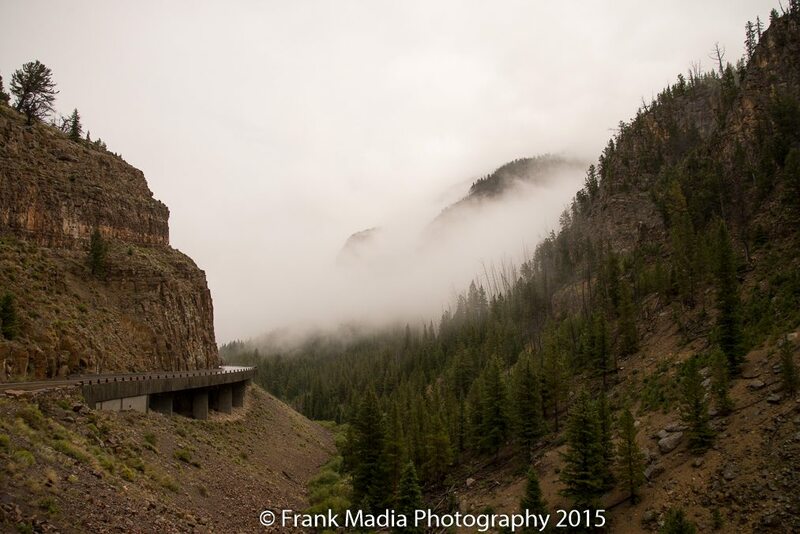 In the five summers Connie and I have lived and volunteered in Yellowstone National Park, I cannot remember another time when we witnessed this much fog in August. The Golden Gate is about five miles south of Mammoth Hot Springs on the west side of the Grand Loop. Turning 180° from my position for the previous photograph I was able to capture Rustic Falls while it was still running relatively strong. Just a few weeks later there would be less than half this volume of water going over the fall. 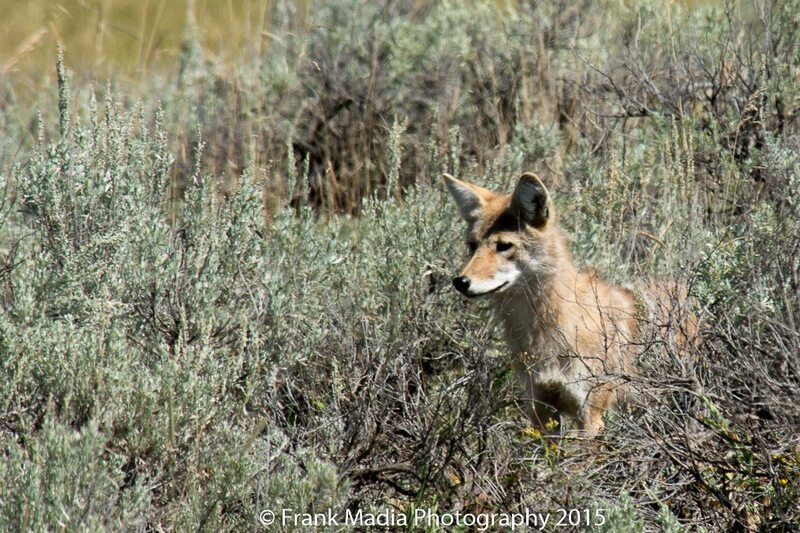 On yet another of our frequent drives we came upon a group of visitors who were keeping a close eye on this coyote. We were all turned into the parking area for Wraith Falls, east of Mammoth. As it turned out this coyote was being harassed by a badger. The badger would charge the coyote with its tail sticking straight up. With the tall sagebrush, the tail was really all one could see of the badger. The coyote looked more confused than afraid. By the way, this too is a crop of a much wider angle shot. This animal was easily 80 yards away. I wanted to see how well my new camera could do with night images. So, one evening I set up a tripod and gave it a go. I had the ISO cranked up to 1400 to get this image. 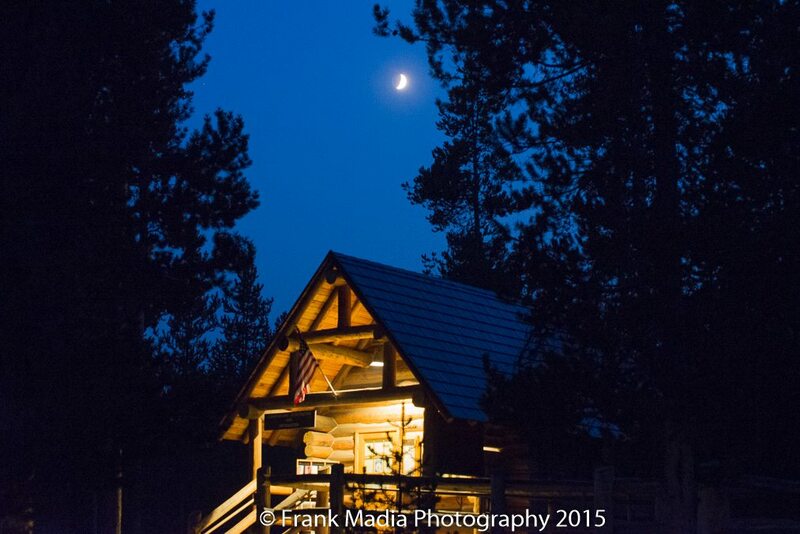 This is the registration cabin at Indian Creek Campground. The high ISO caused the moon to be a little over-exposed, but the rest of the scene came out just about as it looked with my eyes. Another shot taken late in the day with very low light. 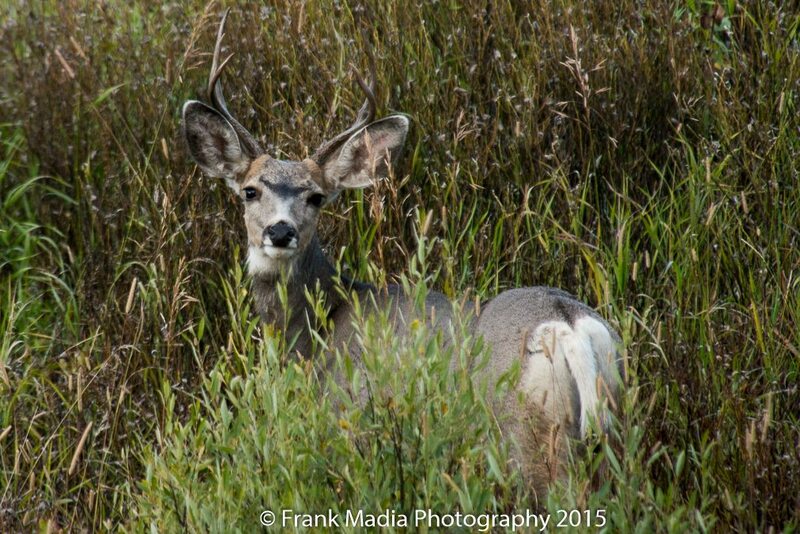 This Mule Deer buck was grazing just below our campsite. I made this photograph at 7:40 PM on September 3. The photographs above represent what I have termed practice photos with the new camera. During this time frame, I traveled with two cameras and four lenses. If I really wanted the shot I would use my Nikon D90. 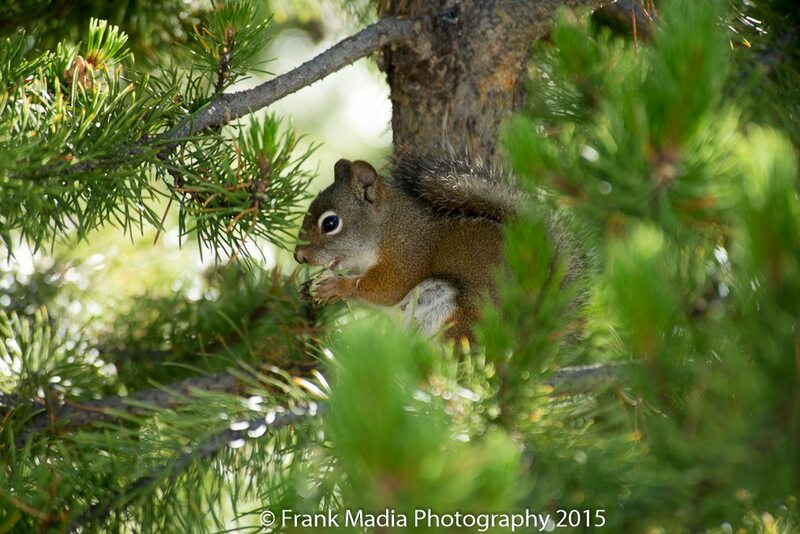 It wasn’t until we had moved to Mammoth Campground that I had enough confidence to shoot only the Nikon D610. The story continues. I don’t remember for sure if it was late August or early September, but John and Sandi were visiting Cody, Wyoming for a few days. John had asked me what our schedule was for the time they would be in Cody. Unfortunately, we were working, so I didn’t see us getting together. One afternoon while I was out in the campground making sure the campers were following the rules, Connie called on the radio to ask what I was up to. After I responded she suggested I get back to the office. When I got there I was surprised to find John and Sandi hiding in plain sight. They had decided that if we couldn’t come see them in Cody, then they would come to us on a day trip. What a great surprise. This was their first visit to our summer home, so it was fun to show them why we love it so much. Our last visitors of the season were friends from Bremerton, Washington, Joe and Janet Drouin. Janet and Connie had worked together at a doctor’s office in Bremerton well before Connie and I met. I came into the picture and changed things forever by marrying Connie and taking her away. Janet was Connie’s matron of honor at our wedding. Needless to say, these are great friends. Unfortunately, their arrival in Yellowstone coincided with our repositioning from Indian Creek Campground to Mammoth Campground. Joe and Janet brought their fifth wheel and were staying in Gardiner at Rocky Mountain RV Park. Once they got settled we met them for dinner in town and got started on catching up. We worked the subsequent two days leaving them to find their way around the park on their own. They did stop in at Indian Creek Campground to see where we worked and what we actually do at work. That visit provided a bit of a break for us from answering questions albeit only one of us at a time. The first of our two days off was spent moving to Mammoth. Being the pros that we are, we were able to get moved and resettled in time to spend the afternoon and evening with the Drouins at the RV park. Janet prepared a great dinner. They updated us on their travels through the park. Joe was a bit frustrated because he had not seen any grizzly bears. We told them about a great place outside the park to find these wonderful creatures, but by then they had run out of time. We enjoyed one another’s company well into the evening, but since they were scheduled to leave the next morning and had a long drive planned, we didn’t want to keep them up too late. Unfortunately, their little dog, Gabi, was having a terrible time breathing. They thought it was her allergies, but by morning, she was in really bad shape. They took her to a veterinarian in Livingston, Montana, but sadly she did not survive even with the treatment provided by the vet. It was a very long and sad trip back to Bremerton for Joe and Janet. In years past, once we moved to Mammoth we saw an immediate drop in visitation. We would continue to fill the Mammoth Campground, but the fill times would move later and later into the evening as September progressed. That was not the case this year. We started our tour in Mammoth filling before noon for several days. It wasn’t until late into October that we stopped filling, but we found ourselves checking people in as late as 10 PM most nights. By then we were working three days on and three days off. Needless to say, we were starting wear a bit thin. This busy trend was shocking to many of the campers who come to the park every year in the fall. Because of the early fill times, many of the “regulars” found themselves without a place to camp within the park boundaries. So, as was the case all summer, we spent a good bit of time most days calming anxious visitors by providing them with out of the park options for camping. Of course, we always asked them to return early the next morning so they could stay in the park for the rest of their visit. Some days those early returns found themselves having to wait a few hours for a space to come available. This became more and more the case as the overnight temperatures dropped. No one is in a big hurry to get out of a warm bed or sleeping bag on a cold morning, especially if they are leaving the park that day. I found myself circling the campground numerous times each morning watching to see if there was activity at sites not yet rented for that night. When I spotted people up and around I then had to ask that sensitive question, “what are your plans for today?” If they informed me that they were in fact leaving, I then had to assure them that I was not trying to rush them, only get as accurate an inventory of available sites as possible. Of course as the line of people waiting for sites approached the road, I really did want to see those scheduled to leave to get a move on. It was a bit stressful, but we survived. I don’t want to make too much of the work because there is just too much fun being had between workdays and to a large extent while working as well. For instance, when we got down to working three days on and three days off our social schedule was impacted because we could no longer spend off-duty time with Rick and Donna as they were working our off days. So, we decided that on one of our respective days off the off duty couple would prepare dinner for the on duty couple. We tried to host these dinners at our respective rigs, but as fill times moved later and later into the evenings we decided to cook at home and then have an office dinner so that the on duty couple could take care of the incoming campers between bites or courses. This solution worked well to keep us all happy and sane. It also provided a great opportunity to try different recipes on one another. It was all fun. We even invited our supervising ranger, Allan Bush, and his wife, Barbara, to join us for one of our office dinners. That was great fun. Of course, it was not all work and no play. Connie and I got out frequently in the fall to see the sights and make some memories. We were very fortunate to be able to travel the park on many occasions with our friends Rick and Donna while we were rotating two days on and four days off. On one wonderful morning, we saw a grizzly bear, a wolf, and otters all within a few hours of one another. 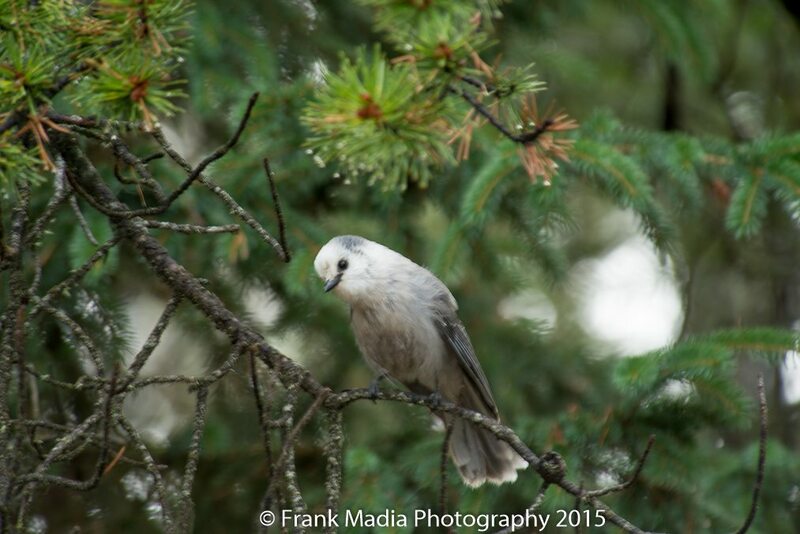 A Gray Jay right out of our living room window at Mammoth Campground. The first signs of snow coming into the park. This photograph was made on Swan Lake Flats on September 16. I thought we might be in for a snowy fall season. This was probably the last snow we got until the day after we left the park for the season. One fall morning with Rick and Donna on board we traveled from Mammoth to Lake Hotel for brunch. 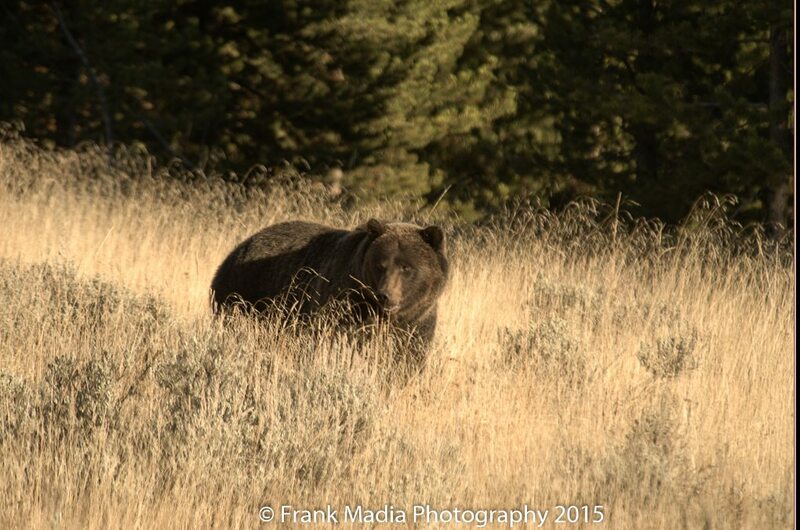 On the way we saw this Grizzly Bear near Canyon Village. 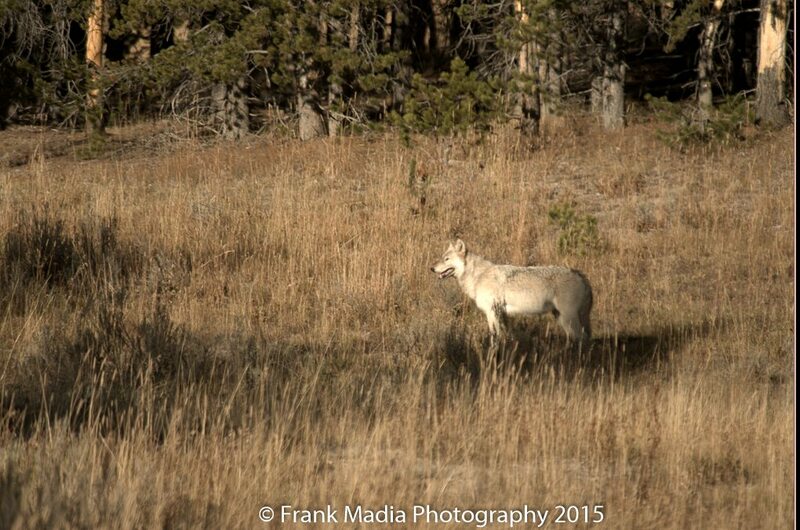 Just a few miles down the road we saw this wolf. By the time I was able to safely get the car off the road and stopped I was already late in capturing a great image of this magnificent animal. When we arrived at lake there was still a bit of a haze over the lake. There was a small fire burning on the far side of the lake that caused the haze. 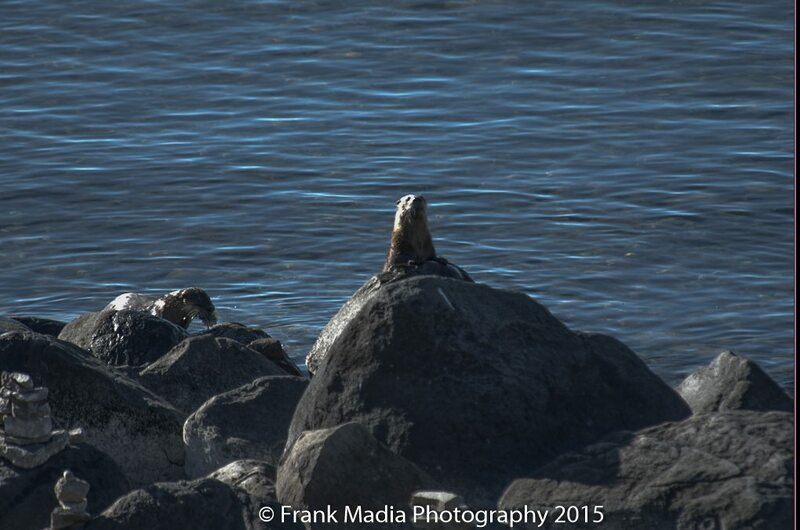 There were two otters who were also trying to have their breakfast on the rocky beach of Yellowstone Lake. After a great brunch we continued our journey around the lower portion of the park. 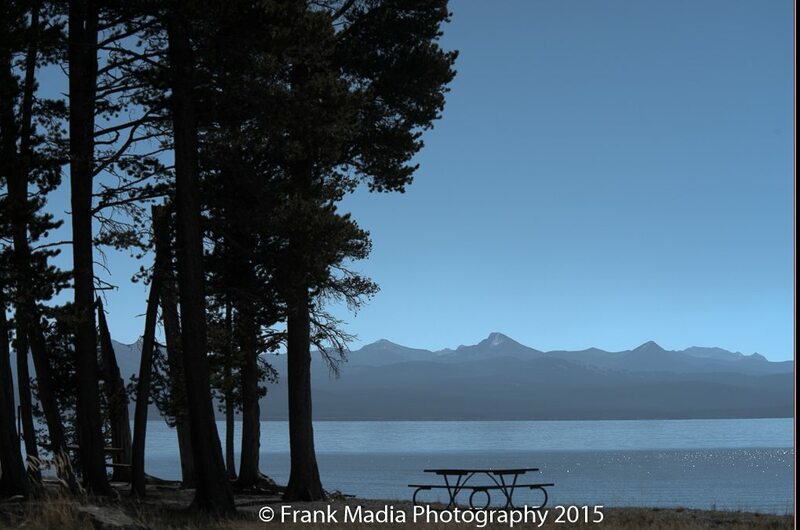 I couldn’t help but make a photograph of this picnic area. I am always on the lookout for fall colors. 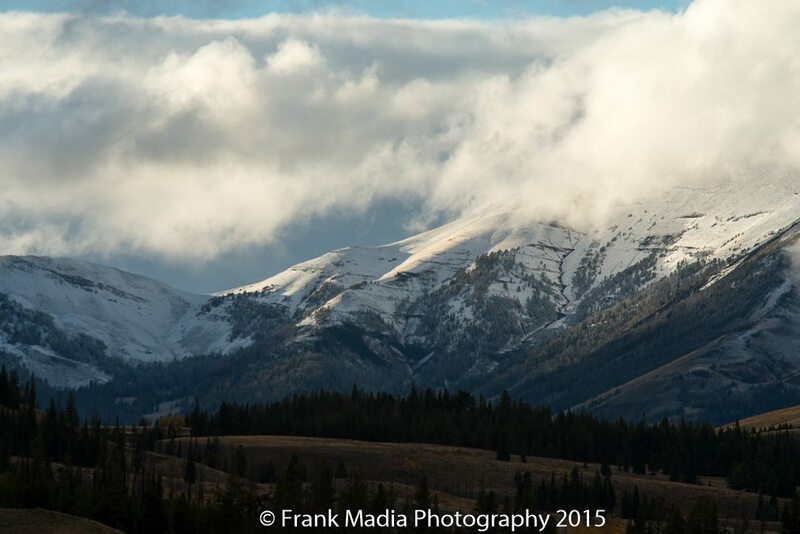 Yellowstone doesn’t give much in regards to range of color, but what there is can be stunning. Well, that about does it for Part 2. The third and final part will feature some early morning outings I made later in the fall while Connie enjoyed some peace and quiet and late sleep-ins. Some lovely photos–you are really getting good! 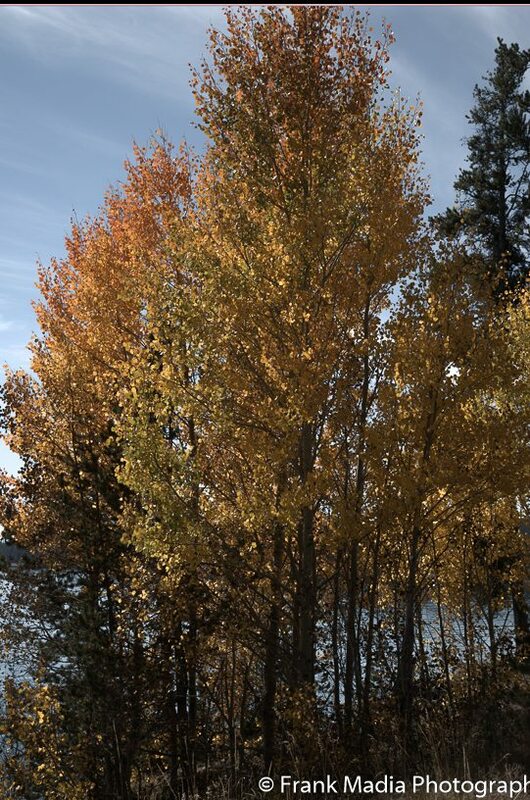 I love the last one of the trees–it really captures the subtlety of the colors! I am so glad I am on your mailing list. I enjoyed reading about what your work days entailed and I found the photos to be unique and amazing! My favorite is the squirrel and the bird pictures, especially the bald eagles. They are such a rare treat to see, much less photograph. Thanks for sharing once again Frank. It is a breath of fresh air for me when I partake of your Blogs!!! Love to you and Connie.